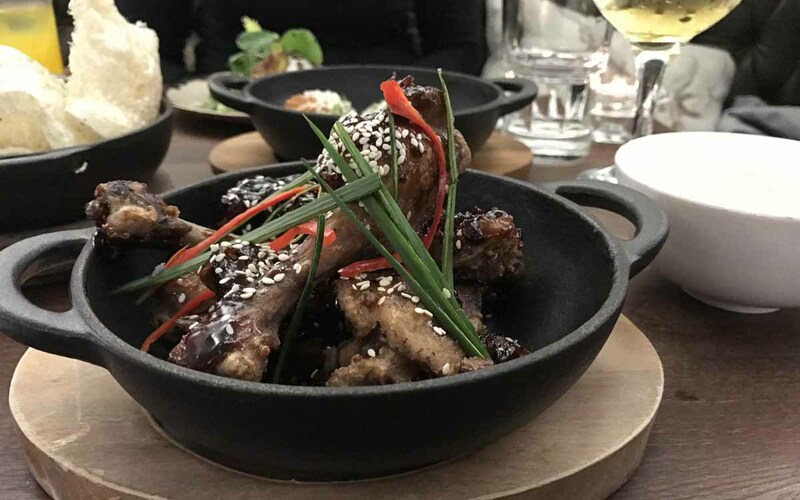 On Saturday night we made the short trip from Newcastle to Ballynahinch to try out the recently opened Bull and Ram restaurant. Located beside the main roundabout as you travel through Ballynahinch, the Bull and Ram has been making all the right noises since opening its doors back in June, and it even impressed one of our favourite food critics, Jay Rayner, who shared a fantastic review on The Guardian (you can check it out here when you’re finished with this one). Set in an Edwardian building, the Bull and Ram has a certain charm about it, and on Saturday night it had a real relaxed and friendly vibe among the packed dining room. The interior almost made us feel like we were sitting in a restaurant in the middle of Paris, but here we were, in Ballynahinch, ready to tuck into an amazing three course feast of brilliantly prepared local produce. Head Chef, and the man behind Bull and Ram, Kelan McMichael (previously of the award winning gastro pub The Poacher’s Pocket) is keen to showcase some of the fine local produce, especially here in Co. Down. 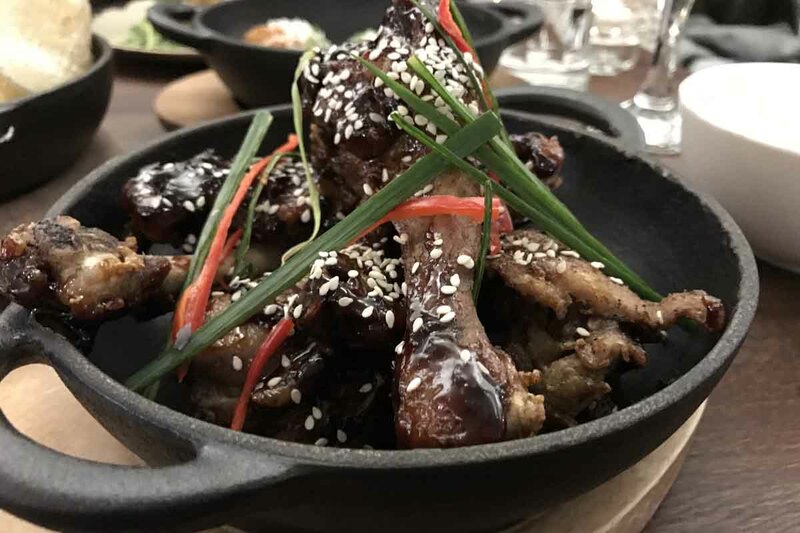 Despite only being open since June 2016, the Bull and Ram has won a number of national awards, highlighting the sheer quality of food and service that awaits you in this relatively new NI eatery. 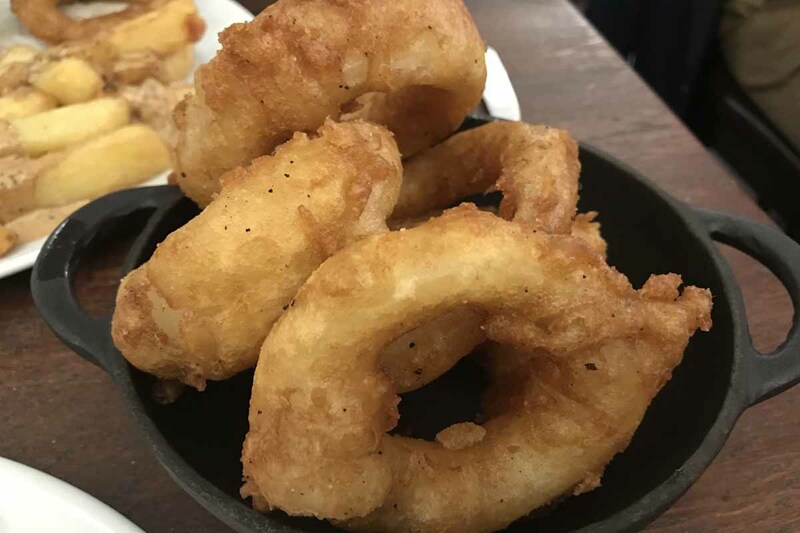 Star of the show is the 40-day and 28-day steaks from Hannan Meats in Moira, and these proved to be the centrepiece of our wonderful dining experience. 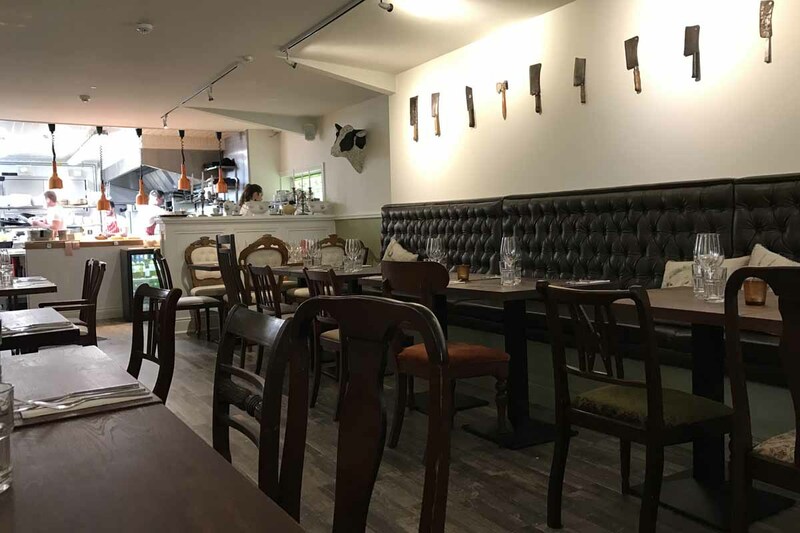 Indeed, the restaurant is set in a Grade 1 listed butchers shop, and Kelan and his team have certainly carried the butchers theme down to a tee. From the original tiled floors and walls to the meat cleavers hanging on the wall, this is a must see for meat lovers! 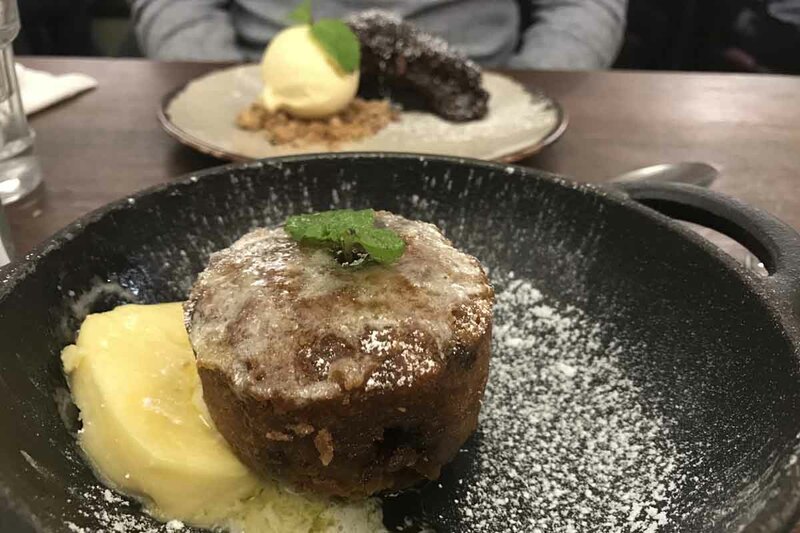 Read on to find out about our great dining experience at the Bull and Ram, one that we’re keen to enjoy again in the not so distant future. The menu was a feast for the eyes and had us salivating before we had even begun. The steaks grabbed our attention straight away so with the main sorted, we decided to order something to get our tummies warmed up. Before tucking into our starters, we were sent two dishes courtesy of the head chef himself, and they certainly didn’t disappoint. 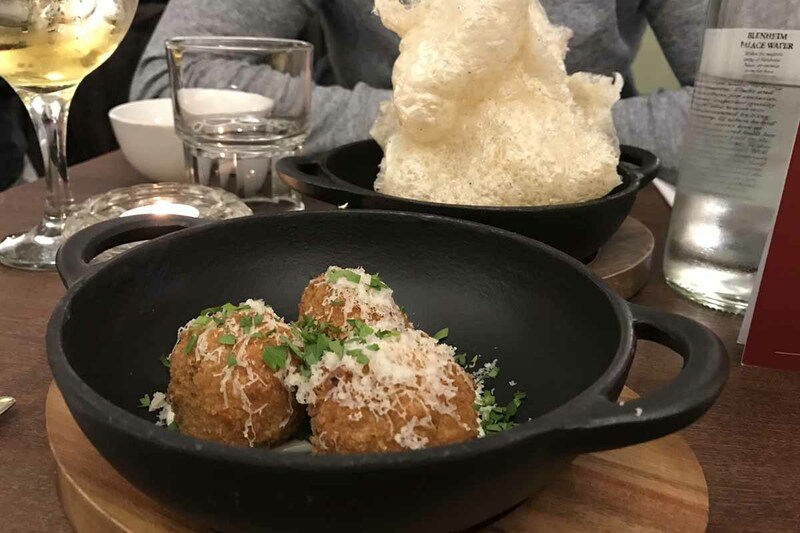 We shared a bowl of homemade pork scratchings with apple sauce and a portion of oxtail and Young Buck blue cheese arancini with a horseradish mayo. With a healthy helping of scratchings, and a scrumptious apple sauce to get us going, we were eagerly looking forward to the evening of dining that lay ahead. The oxtail and blue cheese arancini balls were sublime, a real highlight of the night. With our taste buds suitably up and running from the light bites, it was time to tuck into our starter dishes, and boy were we looking forward to them. First up was a whipped local goat’s cheese with toasted brioche, figs, pumpkin seeds and Burren balsamic. 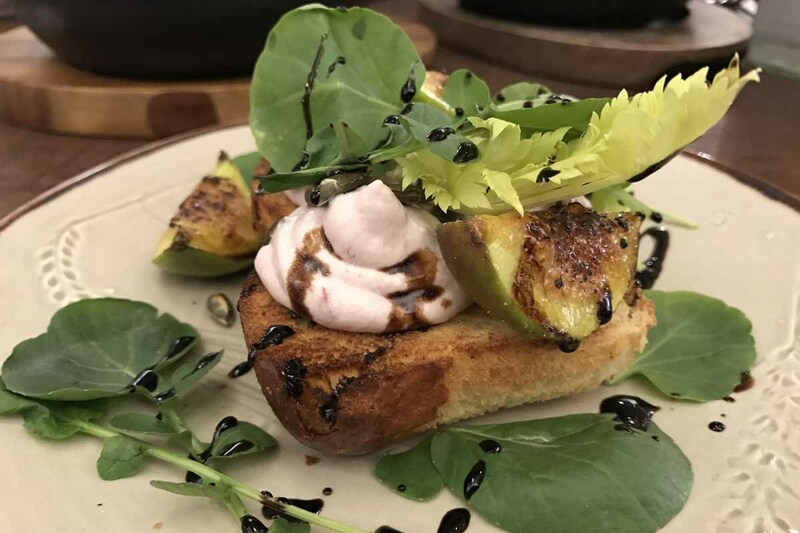 The generous portion of whipped goat’s cheese was light and creamy and perfectly offset by the fresh, sweet figs and the sticky yet sharp balsamic glaze. There are a number of great starter choices at Bull & Ram, including Dundrum crab, Walter Ewing’s smoked salmon and Scallop ‘Rockefeller’. Indeed, the table beside us had the scallops for starter and the smell of the scallop with smoked bacon and garlic was something to behold. We’ll certainly be trying it out on our next visit. Next up was our main course, and we both opted for a steak. As mentioned above, all steaks are supplied by the award winning Hannan Meats (a 2016 Great Taste supreme champion) and dry-aged in a Himalayan salt chamber. We’re not sure how the Himalayan salt chamber works, but damn it makes the meat taste great! The steaks we opted for were they 40-day aged sirloin (300g) and the 28-day ribeye (300g). All steaks come served with a side and sauce of your choice. We both went for the beef dripping chips, and Helen had the Bearnaise sauce while Nial had the peppercorn sauce. We also ordered a portion of onion rings, a must when enjoying steak and chips as sublime as this. The cuts of steak were definitely up there with the finest we have ever enjoyed, and the chips were fantastic. 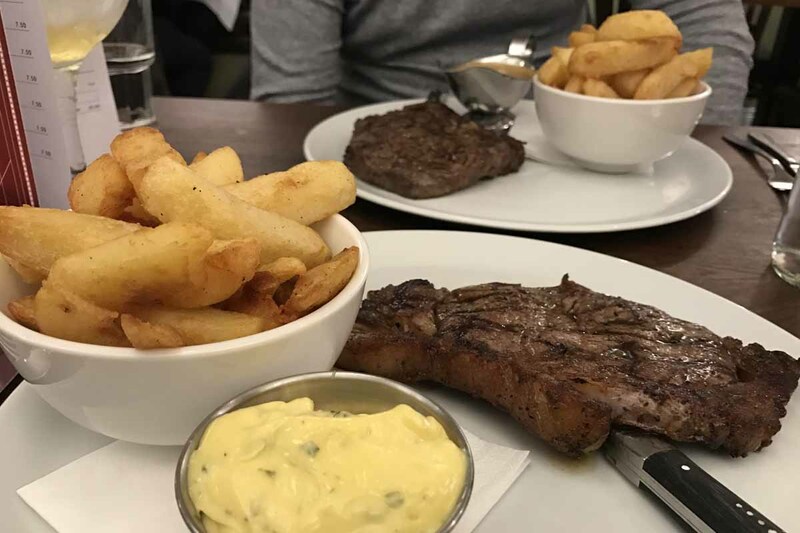 We would recommend the 40-day steak if you are planning on visiting Bull & Ram anytime soon, although whatever you go for, you won’t be disappointed. Perfectly tender, no matter how you like yours cooked! Price – 40-day sirloin – £24.95 and 28-day ribeye – £19.95. Side of onion rings cost £3.50. The guys also offer three types of sharing steak which are the Côte de boeuf, T-bone and Chateaubriand, priced £55.95, £57.95 and £59.95 respectively. If you’re a steak fan then you simply must visit Bull & Ram; it would be a crime against meat. Regulars to the blog will know we have a bit of a sweet tooth, so we simply had to grab a dessert, especially after seeing desserts land at the tables around us. The desserts we went for were a Valhrona chocolate torte with a passionfruit sorbet, and Christmas pudding with brandy butter. The Valhrona chocolate torte was a really rich, dark chocolate flavour, so the chocolate fans among you will love this dish. The tangy sorbet was the perfect accompaniment to cut through the richness, while a crumb added texture to the dish. The Christmas steamed pudding instantly awoke our festive taste buds. Far from stodgy, this rich yet light pudding had everything a great Christmas pudding should have and provided the perfect insulation before heading out into the cold night air. Both desserts were packed with flavour, and a great way to finish our evening, an evening in which all dishes really packed a punch in terms of the flavour and quality of the food. 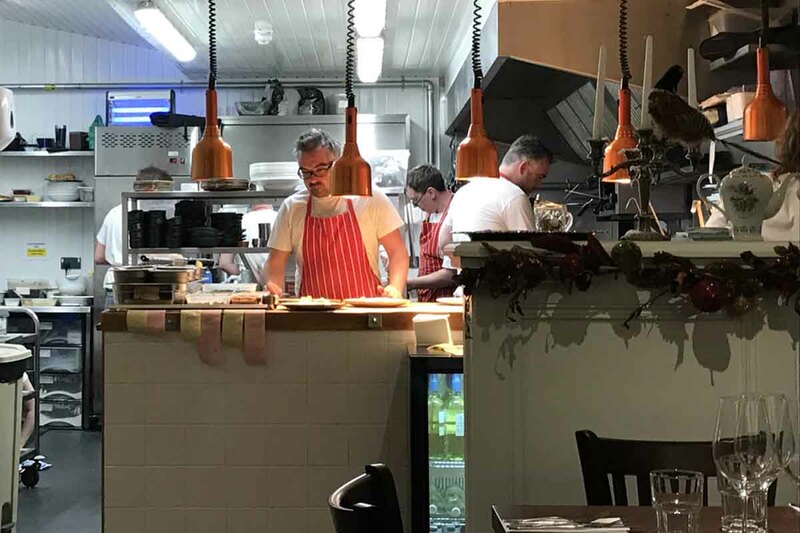 Kelan and his team certainly know what they’re at, and with a menu showcasing some of the finest produce in Co. Down, we can’t wait to get back again to try out some new dishes. Have you been to Bull and Ram? Have you managed to get along to Bull and Ram yet since it opened? We’d love to hear what you thought of it, especially if you tried out their range of steaks. At only a 25 minute drive from our home town of Newcastle, and 30 minutes from Belfast, the Bull and Ram is reason enough to get yourself down to Ballynahinch over the Christmas season. 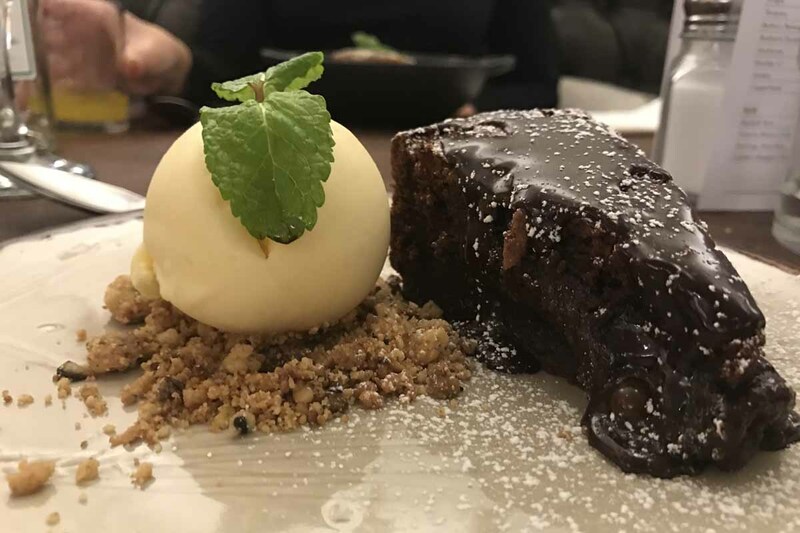 With an all-day menu (which we dined from), a Christmas menu, daily specials and a Sunday lunch menu, there’s plenty of choice for all the family, and we’d highly recommend getting along and checking this gem of a restaurant out. The ambiance of the restaurant really sets the scene for the dining experience, and the no fuss approach to the food delivers on so many levels. The staff were so friendly and helpful as well, great service to top off an already brilliant evening of food. As we’re about to finish our year of food and drink here in Northern Ireland, it’s great to see top chefs like Kelan, champion some of the great produce we have in the surrounding area. Kelan and co, we tip our hats to you!